Good morning! How was the week? I'm telling you, the days just fly by. Don't have tons to show for it though. I did manage to finish piecing my Easy Addition blocks, they're in a stack ready to layout. I made 35 blocks for a 5 x 7 layout. Now to find a place to lay them all out. Some vacuuming is in order first. I have almost all of my ScrapBasket Sampler blocks done. These have been such a treat. I'm telling you, Cheri's Friendship Group is so nice. Next week we move onto the applique portion, and I'm really looking forward to it. I'm waiting till I see it to decide on which fabric/fabrics to use for my alternate blocks. I love how nice and casual this sampler is. I've been a little too casual this week though and still have to catch up. Ok, it's April. NO JOKE! That's shocking news. It us shocking news! How did that happen? Soon it will summer, then Fall and right afterwards Inwill be getting Christmas out. Guess I should have left it out to start. 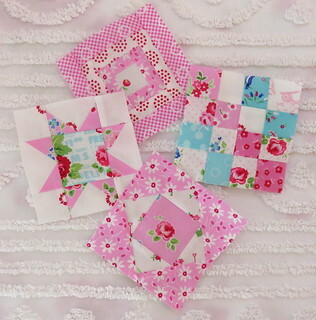 Cute, cute blocks, I have got nothing done this week!